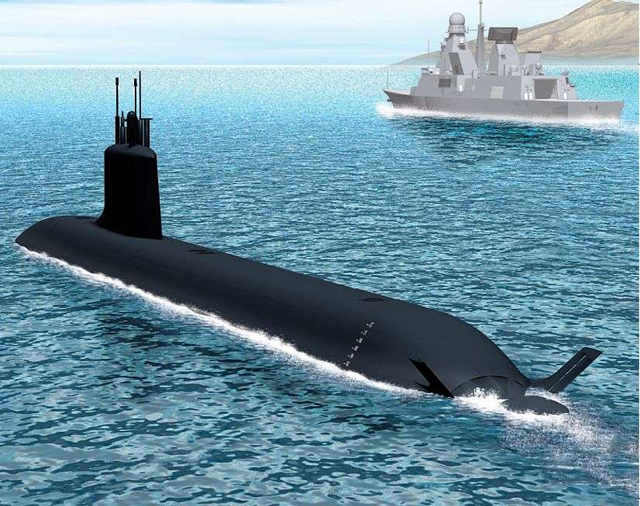 Between 2017 and 2027, Barracuda-type nuclear-powered attack submarines (SSN) will replace the Marine Nationale (French Navy's) current-generation Rubis/Améthyste-class SSNs. Navy Recognition recently had the unique opportunity to ask the French Navy's Barracuda program manager & officer a few questions on the next generation submarine of the French Navy. Navy Recognition: When did the program started? Preliminary studies started during the late 1990s, but the defining phase only started in 2001. The program was awarded in December 2006 to DCNS and its partner AREVA TA. It provides for the construction and acquisition of 6 Suffren class SSNs, as well as several simulators (for diving safety, cruising safety and tactical training) operation of the nuclear reactor and the boiler room, the initial logistics of these means, and the overhaul of the entire port infrastructure associated with these resources to sustain them. The acquisition of two DDS (Dry Deck Shelters [ed. note: for special forces), the MDCN program [ed. note: MBDA's Naval Cruise Missile] and the development of the F21 heavyweight torpedo are important programs linked to Barracuda but are not part of the scope of the Barracuda program. For this project DCNS acts as the prime contractor for the submarine. In that role DCNS directed the overall architecture, the propelled platform, the integration of all systems but also coordinated the nuclear safety studies and operational maintenance. AREVA TA assumes the role of prime contractor for the onboard nuclear steamer. The program team consists of 5 people within the central level of the EMM (French Navy Command) and 5 people in Cherbourg (where the submarines are assembled). In addition, 23 sailors are inserted in the DCNS teams as part of a special agreement. With the creation in September 2015 of the first crew (whose size was increased to 1.3 times the normal crew size) the program team will receive substantial support in the late implementation phase and in the preparation of trials. By adding the DCNS staff and those of the Navy, around 2000 people are working on the Barracuda program which is still in the process of industrialization (the vast majority of the staff coming from prime contractor DCNS). NR: Which new capabilities are expected from the Barracuda type SSN ? BPM: The Barracuda is a major capability investment for the Defense reflecting France's will to maintain its naval power status for the next fifty years. This new submarine will contribute to the deterrence strategy and to the use of conventional means in power projection or intelligence-gathering contexts. Therefore, it will act both as a power projection tool and as a warship. The Barracuda program is based on the technical and operational experience gained over the last few years. It also incorporates threat evolutions and will be able to fulfill all its missions thanks to its exceptional stealth, mobility, endurance and firepower qualities. Barracuda submarines will be fitted with the future naval cruise missile (MBDA's MdCN) and their ability to accommodate and deploy special forces will be improved compared to the submarines currently in service. The strike capability against land-based targets is a new capability for the French submarine forces. The deployment, on a large scale and while submerged, of special forces is an important capability increase. The increased autonomy and minimized scheduled maintenance constraints will also translate into substantial capability gains. Their improved maneuverability and sea capabilities (compared to the Rubis class) make the Barracuda particularly suitable for missions in coastal waters. Finally, significant improvements are expected in the areas of discretion as well as acoustic electromagnetic and optical detection and data transmissions (increased information processing capacity, easier integration into a naval force...). 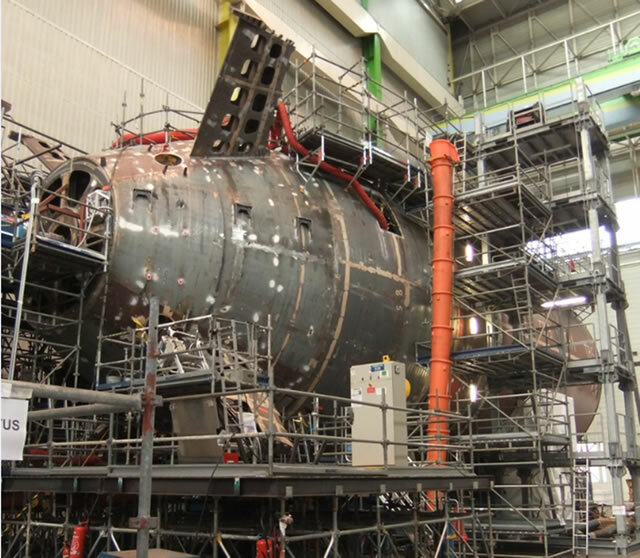 The sail of Suffren, the first Barracuda type submarine, under construction at the DCNS shipyard in Cherbourg, Normandie. French Navy picture courtesy of DCNS. NR: The Rubis-class usual patrol areas are reported to be the Atlantic Ocean and the Mediterranean Sea. Will the Suffren class have the ability to patrol all the way to the Pacific Ocean? BPM: It is the operational needs that dictate the deployment on theater of French SSNs and not their capacities. In this context, the improved capacities of the Suffren class SSNs make their operational use more efficient, more flexible and more cost effective than the Rubis class. NR: According to some observers or experts, the compact size of the Rubis class has a negative impact on their acoustic discretion. Conversely, Le Triomphant class SSBNs are known for their extreme discretion. The Barracuda SSN will be larger than the Rubis class but will remain more compact than the British Astute class or the American Virginia class. What can you tell us about the Barracuda discretion and what factors have driven the final size of the Barracuda ? BPM: The Barracuda received many technology transfers from the SSBN and some further developments that should give it a very high discretion, no comparison to the Rubis class. The stealth objectives of the new SSN are very close to those of the current SSBNs [ed. note: Le Triomphant class]. Their compactness is mainly linked to cost control wishes induced by the port infrastructure renovation [ed. note: necessary to accommodate the new class of SSN at the naval base(s)].This compactness should not be a problem in regards to the submarine discretion however. 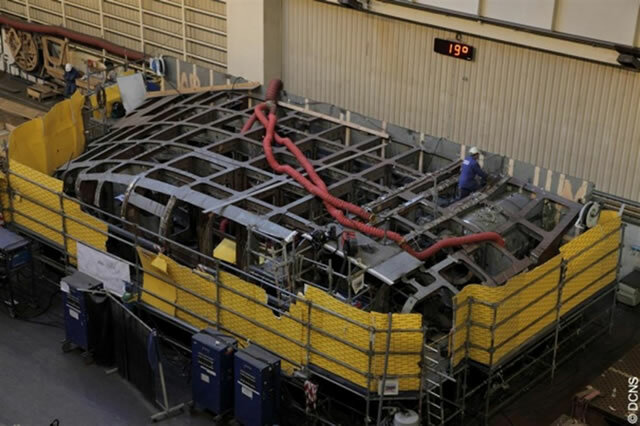 Aft section of Suffren under construction. Note the X-shaped rudders. NR: How many weapons and which types will be fitted on the Suffren class ? BPM: The Suffren class is fitted with four torpedo tubes and twenty weapons storage positions . The SSN will be able to deploy the following weapons: F21 Torpedo, Exocet SM39 Block 2 Mod 2 Anti-ship missile, MdCN (naval cruise missile), FG29 mines. Their weapons fit will depend on their missions. NR: What will be the main strength of Barracuda SSNs? - Its increasing capacities which will constitute their main strength. - The size of their crew (around sixty sailors, almost 10 fewer than on board the Rubis class, for almost twice as big a submarine). - The progress made in areas such as the handling of the platform and the diving safety to achieve a high level of automation are very significant. NR: DCNS is working on a conventional version: the SMX OCEAN. Is it possible that some R&D elements from this new program are applied to the Barracuda program? BPM: First of all, SMX Ocean is a "conceptship" by DCNS gathering all their new technologies. Presented during the last edition of Euronaval by the manufacturer, some of these innovations are intended to be proposed by DCNS on their submarines in the coming years. NR: What are the main challenges of the program so far ? BPM: To keep the required size and capabilities in a constrained budgetary environment. To maintain the overall consistency between the submarine, the other related programs [ed. note: F21 torpedo, DDS etc. ], the infrastructures, the training facilities both physically and from a calendar point of view: ensuring the functioning of start to finish of the desired capabilities. NR: What are the key dates and current status of the program ? BPM: Construction of the Suffren continues nominally in accordance with the planned schedule. The hull should be closed off at the end of the year. The first trial at sea is currently scheduled for 2017. The tests of the propulsion module are currently underway. They are progressing very well. The combat system is at integration phase without any significant difficulty. Masts and weapons handling system have already been tested. The boiler module is on board. The arrivals of the next SSNs are scheduled every 2 years from 2020. Thus, assembly of the hull sections of Duguay Trouin [ed. note: second SSN in the series] is over and construction of Tourville [ed. note: third SSN in the series] is more than 50% complete. Other questions included technical details such as the presence (or not) of a special coating on the hull of the Barracuda SSNs to reduce noise generated by water flow at high speed (hence improving passive detection capacities at speed) or the presence (or not) of a system enabling the Barracuda to maintain a stationary position despite currents and tidal effects (two features present on the U.S. Navy's Virginia class SSNs). The Barracuda program manager didn't wish to answer these questions however because of their confidential nature.